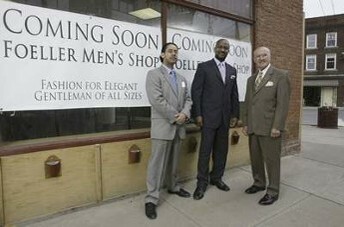 Ron Munoz, Roy Thompson and John Dino of Foeller Men's Shop stand outside the downtown Middletown storefront that will soon house the business' second location. The store's grand opening is set for April 28. Times Herald-Record/TOM BUSHEY. Middletown, A man in a tailored suit, with a handkerchief in the breast pocket and fresh-pressed pleated pants, is confident, secure, going places. Roy Thompson's got that look about him. He imagines more men in this city dressing the same. And he hopes he can make that happen. Later this month, Thompson will open a second location of Foeller Men's Shop on West Main Street. And when the doors swing open on the corner shop, it will mark the return of a Middletown institution to its downtown roots. Long before Thompson bought the business three years ago, he knew one day Foeller would be a fixture here again. And this Franklin Square location, Thompson says, will be Foeller's billboard come April 28 at the grand opening. "This is not just looking for big bucks," Thompson says. "It's about community service. It started in 1945 as a community store. I want to offer that service back to the people." Foeller first opened in 1945 on North Street. About three decades ago, the shop moved out to the Town of Wallkill, first at the Caldor Plaza, and later at Dunning Farms shopping center, where it will continue to operate a shop. Personal service from a small staff, seven clerks, and a commitment to custom fits has kept the business going all these years despite the popularity of impersonal, big-box stores that offer inexpensive, ready-to-wear suits, Thompson says. Foeller is intimate and it caters to big, tall, all sizes from baby boy to grandpa. Department stores, he says, don't have what he and salesmen John Dino and Ron Munoz do, experience and a passion to dress men properly. Thompson spent more than 25 years as a tailor with Macy's, Neiman Marcus and Foeller. Dino, 85, came out of retirement two years ago to return to men's clothing. And Munoz might be a youngster at 28, but he's a clothes-lover with tailoring in his blood, from grandfather to uncle to mother. "I'm bred for this," says Munoz, who this day forgot the handkerchief. Thompson grabs a white paper towel and fashions a makeshift kerchief so Munoz looks put together in pictures. Maybe one day Munoz might take over the business from Thompson, just as Thompson did from the prior owner, and keep Foeller going. Thompson's not banking on it. But he hopes that those who work at Foeller take with them knowledge and skill that will keep the tradition alive long after the doors shutter, if they ever do. "I believe in what you call institution. With an institution, when you're gone, it lives on," Thompson says. "If everybody learns at Foeller's 'the business,' it shall continue on."